1993 is the year when Jurassic Park came out. 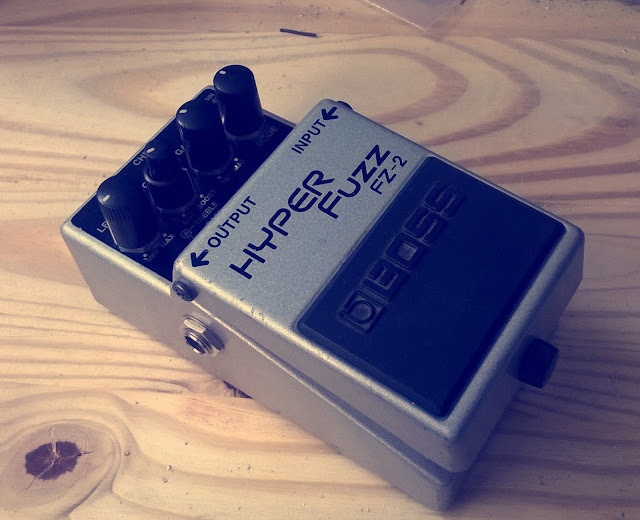 I think it is no coincidence that another monster appeared this year: the Boss Hyper Fuzz! This pedal, produce from April 1993 to June 1997, is a Univox Super Fuzz clone, with some added features. Mine is from August 1993! The FZ-2 is really different from a FZ-3, which is a fuzz with more classic sounds. 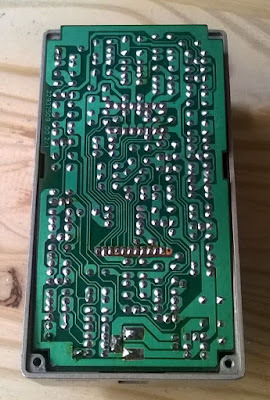 The Boss FZ3 is close to a silicon fuzz face, whereas the Boss fz2 is really peculiar, really close to a Super Fuzz. The pedal has 5 controls (the second potentiometer is a double one, and allows you to set bass and trebles). Level sets the volume, second potentiometer sets bass and treble amounts and the gain potentiometer sets the fuzz amount. The last knob lets you choose between three modes: Fuzz I, Fuzz II and Boost that a simple clean boost. Once activated, the pedal delivers all the loudness and heaviness of the Super Fuzz. There is an octave down that is added to your guitar tone, which provides you a huge bassy sound, and a slight octave up, more hearable when playing near the 12th fret. The octave up sounds a bit like an octavia, but with less octave. The saturation is extreme, especially in "Fuzz II" mode that is a scooped mids setting. I really like it, it is a riff machine that makes you wants to tune down your guitar. It is easy to play powerful and heavy riffs. It is also really interesting on bass guitars. The boost mode is a clean boost with quite a lot of gain (+25 Db! ), and you can set the bass / treble amount with the second potentiometer. Nice to boost an overdrive pedal, or to make your amp crunch, but nothing really new. Nice conception job! Boss engineers are monolayer PCB experts! Vintage style! Old film capacitors, lots of 10 uF electrolytic capacitors, lots of transistors, 2 diodes (D4 / D5) to create saturation, this is definitely a Super Fuzz! In the middle, the two black bars are in fact ICs, operational amplifiers, old school version! They are used to set bass and treble content of the circuit. We can also notice 1/8W resistor to make the circuit fit in a Boss enclosure, and the high number of components, it goes minimum to R62 and C35! We can see that they are 2SC3378, old transistors that are not produced anymore, which have a really small amplification factor (hfe) of 50. For instance, MPSA18 that are modern transistors have a hfe of nearly 1500!! Indeed, the Super Fuzz has a lot of transistors, and if the gain is too important, the sound will be "mushy" with no sustain. Whereas with low gain transistors, the sound is smooth, heavy and saturated. 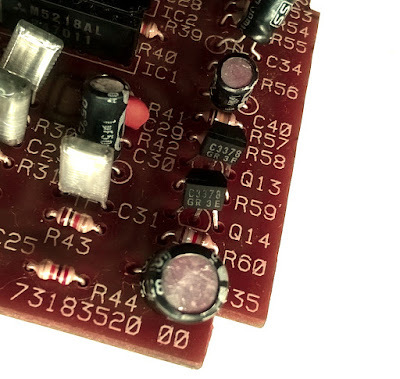 When the circuit was conceived in the 60s, there were no such things such as high gain silicon transistors, this is why low gain transistors are required to make it work correctly. First, we can recognize the famous buffer from Boss ("flip flop" circuit in the bottom left corner) that allows the signal to be transformed into low impedance signal. 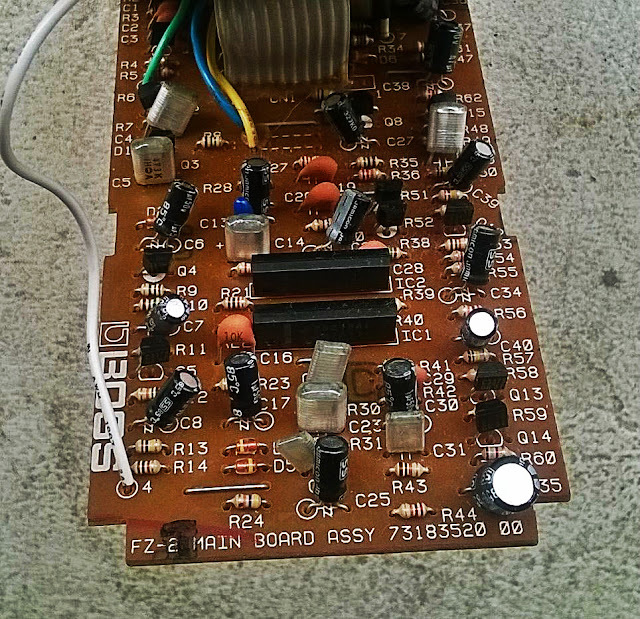 The Super Fuzz circuit is clearly recognizable (from the "gain" inscription to the right side of the image), with the two transistors Q13 and Q14 that are facing each other with a common emitter: they will create the octave sound. 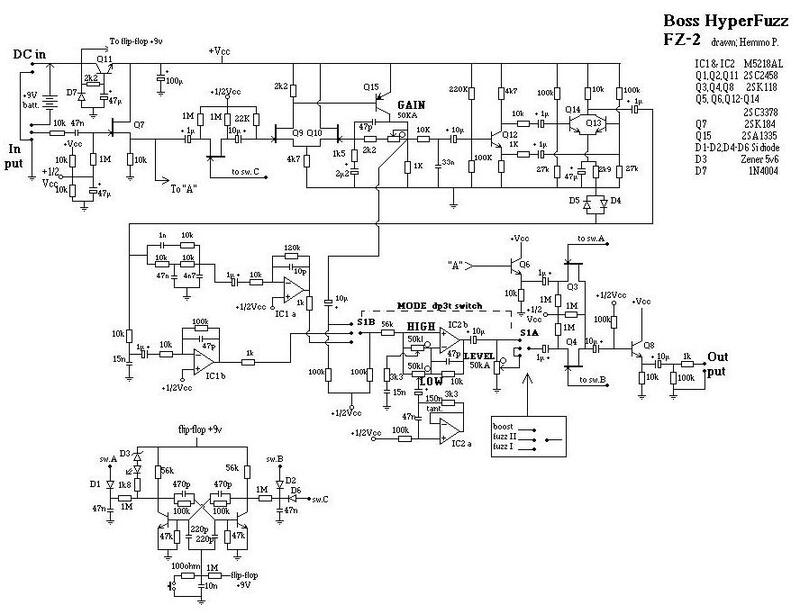 Then, there is the bass and treble control circuit with 4 OP amps, and the switch that allows you to choose between Fuzz I, Fuzz II and the boost.